OK, the internal construction of the front of the house is under way ... the builder is getting ready for the next stage: Designing a small bathroom/laundry! That singularly inviting space, with a separate toilet, was right at the back wall of the '60s extension to my little house. You can see that original bathroom was completely scrubbed from the layout, making way for a much larger kitchen and some glorious French doors leading into the garden. The new bathroom needed to squash into a kitchen corner - not a particularly easy space, but that's what I had to work with. So time to tackle some serious space/functionality design challenges ... and win! Size-wise, the bathroom had to be as small as practically possible, because every centimetre taken was going to reduce the size of the kitchen/dining, the key activity centre in the house. 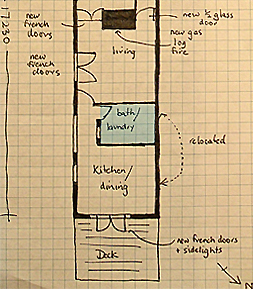 I played around with lots of small bathroom floor plan variations, and eventually decided that I needed to create a passage from the living room to the new French doors at the very back of the house onto the deck, the main access - so an internal bathroom was the only workable solution in this incredible train-carriage of a house. This was very disappointing, as it would require a skylight as I absolutely adore natural light ... then, a brainwave! ... the window would be perfect for the bathroom because Gill had designed it with coloured and rippled glass, and therefore would let light in but still allow for privacy in the bathroom. Excited by this idea, I selected for the bathroom a door which had provisions for glass panes in the upper half, to let even more light into the bathroom. And as luck would have it, opposite where the bathroom was to be located was a large external window (the old kitchen window) which provided plenty of light - voila - a naturally lit internal room! I didn't even need to put in a skylight, which would have been extra expense. I took the window to the local Glass Design Studio and selected glass to complement rather than overpower the sweet design in the window - so I chose a matching purple for the four corner panes and had all the other glass cut in ripple clear to match the ripple clear in the window - sweet! Finally - another lucky input - this time from the electrician - a delightful professional and thoughtfully creative man. When he installed the boring but practical downlights and heater light in the bathroom he installed a two halogen lights on a track above the window, on a separate switch. And these shine through the coloured glass into the passage - a real treat to have an illuminated glass window. It has now become a real feature of the house design ... thanks, Trav! Problem 2 - The Actual Floor Plan! I made a scaled floor plan, drew up & made scaled cut-outs for the individual components - vanity, shower, toilet, laundry sink and washing machine - all to fit into minimal dimensions. And I squeezed, manipulated and juggled the individual elements till I finally got a workable solution in the minimum space. 1. When the bathroom door was left open, NOT to provide a view of the toilet! 3. Shower 1000 x 1000 - I HATE squashy showers! 6. Room to change and dress for the shower! Leaving one entire wall free to increase the apparent size of the room and allow plenty of rail space for towels, hand towels and bath mats, and hooks for clothes. Having access to piped natural gas meant that I don't need to provide storage for water cylinders; instead I have selected on-demand hot water - infinite hot water - purrrfect! After using the bathroom for 12 months - yes, it works very well, just - I wouldn't want it a centimetre smaller! And storage for towels is a challenge - I keep the main supplies in with the rest of the household linen (in the second bedroom), and that works fine, just keeping one spare set in the vanity cupboard below the sink. An unforeseen problem has been caused by having the vanity directly adjacent to the shower bay - it is difficult to clean in the tiny gap - but a small price to pay for a great small bathroom! So I am using the bathroom and it is great, but still no tiling and still bare boards on the floor - these will be done as part of the final stages of the renovation ... when I do the kitchen/bathroom finishing. Renate's comment: Thank you for your update, Wanasai! The stained glass window is absolutely gorgeous, and what a lovely idea to have it lit like this - it creates a lot of atmosphere in what might have otherwise been a drab hallway! The stained glass window is beautiful. Does it open? Wanasai, d'you think you could maybe do us a floor plan of the completed bathroom? With measurements and all? Even if it were the most boring little bathroom in the world, that window would rescue it. The window really is the defining feature of that bathroom - looks great! Join in and write your own page! It's easy to do. How? Simply click here to return to Wanasai's Extreme Home Remodel, Hobart, Australia.